I greet you beloved family. I reach out from my heart to yours. I reach out to embrace all who come together for this time of alignment; where you are align within yourself; you align with I the Goddess; you align with the community of people that join together in support of one another. These times when you get together for these channels are created long, long before you actually have the experience upon the Earth. There is such transition taking place throughout the Universe and on your Earth Plane. As a result of this there is a flow and a dynamic that needs to take place to support all supporting the Universe, supporting the Earth, supporting humanity, supporting everyone that is involved in these energy alignments. With so much that is taking place upon the Earth it is an opportunity for you to find that greater amount of clarity within yourself. By that what I speak about is, just as Shelly was talking about prior to this channel, that integration that is taking place in our conversation the two times we got together in June and that integration is going to continue to take place. It is going to continue to support you. It is going to continue to assist you as you move forward in anything at all that it may be happening within your life. This night is coming upon the energies of the 4th of July for those that live in the US which is about independence. Your independence is something that can be looked at as you the person, as you in your community, as you in your state, in your country, in the world. No matter what level you look at this independence it is something that has multiple, multiple layers that are taking place. One of the things that I wish to say is that I know there are many people who do not feel that they have independence. Who do not feel a sense of community or a sense of their country. Partly this is an experience that you find yourself in. It is also about the understanding that as a world you are moving away from the individual countries into a Worldwide Civilization. Now I hear a lot of people saying that, “no that’s not true at all”. So it’s about your perspective. Certainly, within your communities or within your Societies you are still living in the space and experiencing the space of your own community and country. However, ever since the internet became about and people have been able to communicate instantly from all around the world you are shifting into a more global community. So, while it may not seem that’s the reality that is taking effect more and more readily than what people sometimes realize. The other thing that I wish to discuss with you; okay I’m going to wait until we’re in the All That Is because I think this next part may be better for you to experience it on your own. Okay so let’s see. I invite you… I know I feel a little different. For those of you who may be wondering why I’m a little bit different Shelly is trying to ground herself where she is and create this bubble of energy that will allow for the full expansion that we always have. So, I will continue to speak. I will continue deeper and deeper as we continue this channel. Take in a breath where you once more breathe through your heart center sending that energy all the way down into the Earth. As you align with Gaia let yourself spread out those energies. Let yourself expand in such a way that you can feel yourself becoming grounded and you can feel the energies of the Earth as they are supporting you. Because you do this on a consistent basis, frequently, you will go to that same space in the Earth. Allow that to flow back up within you grounding that energy into this space and sending that energy out through the top of your head. As it moves out the top of your head allow to shift into the space of the All That Is. Let us shift back for a moment allowing us to shift into the space of your Higher Self. What is interesting I felt many of you just go straight to the All That Is and that is completely fine. As you know we have a tendency to go step by step. So for those of you who appreciate moving in slowly allow yourself to do that. So, for those of you in already in the All That Is by all means remain within that space. However, for the remainder of people when you first leave the energies of your Human self and your physical reality you find yourself aligning with your Higher Self. Your Higher Self is that space, or that energy, that essence that is you as the Human blended with you as your Divinity. Much of your intuition comes from this space. You then stream your energy even further there is a link or a cord that links you the Human directly into you as your Divinity. As you align with your Divinity recognize that this is the space; that this is you with all the lifetimes that you have had; this is you as your God source; this is you with that thread or the stream of consciousness that takes you directly back and to Source. The central spiritual sun is the source which everything derives the planet, humanity, other species. It is the foundation for the Universe and the Omniverse. As you allow yourself to feel this space look around. It may seem very big expanded or it may feel as if you are wrapped up in the arms of your Divinity so that may hold you and support you with where you are. I the Goddess walk in and amongst each one of you. As we do so I reach out to embrace you in this now moment. As our energies blend with one another we shift moving into the space of the All That Is. For those of you that are already here you may already be on the journey that is yours this evening. For those of you who are arriving look around at this space. Look around at what is here for you. The All That Is is continuously changing. There are layers of vibrations within the space. Each one of you have created your space however you are also interrelated with other people who are also here within this space, be a conscious or unconscious. Whenever we get together for these meditations there are so many layers of transformation that take place. There’s that which you listen too. There are the unconscious layers that are creating changes and potentials for you. There is also an interaction that goes on between you and your Divinity and your manifestation. Here you are in the All That Is and sometimes I feel that these meditations are somewhat busy. They keep your active mind occupied as you follow through whatever it is that you are experiencing. When I flow the energy into these meditations my very clear intention is to give you that warm, loving, deep support that will help you to transform your vibration. That being said I invite your consciousness to open up. I touched on earlier in this meditation about independence and I wish to go deeper with what that is. As a general rule independence is about being self-sufficient. It’s about knowing who you are, what you want, where you are going in life and being comfortable. Being able to accomplish whatever you seek that makes one think they are independent. This is a truth. One of the things that I am hearing, not only from Shelly but from others, and I wish to explain it or talk about it again is that the transparency of the energies and the vibration as you continuously ascend and live more fully in the fifth Dimension. In some of the planets out within the Universe and even the Omniverse there is more of a Collective Consciousness that is associated with humanity, not humanity whatever the species may be, we’re telepathy is the foundation. So if one person hurts everybody hurts. If one person is hungry everybody is hungry. As the Earth ascends into the fifth dimension this will become more and more a part of the consciousness of Earth. When you think back to independence it almost makes it seem challenging because if you’re independent you don’t need anybody else. However, as the consciousness of love becomes the foundation for everything happening upon the Earth there is a natural consistent opening of the heart. If ones heart center is open you feel compassion for others. You feel the experiences that other people are having. In some ways this may seem real and an otherwise it may seem like that is not happening or that’s not a reality for you. The foundation energy of this have already been seeded into the Earth. It is one of the ways that negativity gets spread. If you look at it as a wave as people talk about stuff and they step into the pain, the anger, the fear, whatever that may be it has an impact upon them. Therefore, we are shifting it so that when those third dimensional vibrations or emotions are being expressed they can be transformed into the fifth dimensional. You will also begin to realize that while you are still very independent in your thoughts, your reactions and your reality that independence includes supporting each other. You support your friends and your friends supporting you. I wish for people to release a belief system that they have to do things themselves and they’re the only ones who can, so that they can recognize that support of one another is what creates a new reality. So, independence and interdependence become the wave of vibration that you are stepping into. However, if you find yourself in that interdependence in a situation where you are doing an imbalance of the amount of work, or an imbalance of emotion, and it gets too skewed or to out of balance, then it is no longer right for you and you need to disconnect from that and create a new reality. Consider your life. Is there anything like this taking place in your right now life. If you are caught up in a situation where there’s an imbalance and you are not happy with the way in which you are in relationship with someone, then bring up that experience, bring up that belief, bring up any part of it, ~whew~ clear that out. The empathy that you already feel and that is already part of your life is the springboard that takes you into the higher vibration in which you will then move into a telepathic mode. You probably have heard about more and more people on Earth whether they hear the actual words or conversation, or they just get the intuitive messages. This is already taking place on many different levels. Begin to look for that within your own life. As you consider your life consider independence, consider empathy, consider telepathy. Are there times in your life when you already have this experience and where you can see that trend? Is there a part or all of that that you would like to put forth to manifest with in your life? Here within the All That Is is your opportunity to tap into that so as to bring it into your life. Take this moment looking around in the All That Is and put forth a very clear intention, perhaps about your life, perhaps about communication, perhaps about independence. ~whew~ send it through. I wish for each of you to have love within your life. I wish for each of you to have a very solid foundation of love and to have a solid foundation of expression. Can you feel that open flow of love within you? Does it come into you and just kind of sit within your Heart Center and then not move through? As you breathe into your Heart Center feel that direct flow of love; love of God, Goddess; love of Universe. As it comes into your Heart Center allow it to move through your Heart and then move through your Body so that the energy is in a flow, so there is movement. The greater or the more consistent, the ease and the flow, and the more consistent the energy the better you will feel. As you look around and consider others. Are you able to express that love and that support to them that you would like to express? I heard some of you. The expression of love becomes very routine sometimes and it’s no longer that heartfelt soul to soul connection with the individuals, be it your partner, your children, your friends, your coworkers. Understand that the more that you have that open flow of love and it is moving through you and within you it’s strengthening your ability to share love with others. What you can give you may also receive, and again going back into earlier this evening when we spoke about that intrinsic balance that goes with independence and interdependence here’s a way that you can have it be a part of your everyday life. When you give love unconditionally to a person or a situation you are bringing down the flow of love from the Universe, filling yourself up and then sending it out. If you do this continuously or with any situation it will support you. For the times when you feel out of balance it is no longer because you are bringing in the energies of the Universe, or you are taking on the energies of the situation and it is no longer that unconditional love. It now has an attachment which frequently goes with judgement, which goes with shutting down your energies. So I remind you to be in the flow and to be in that open stream of consciousness. Then again, I nurture and support my own self as this flow goes through me so that I am always in the space of abundance. I see you doing this. You can each do this consistently within your life. If you need to practice then practice; however, you are already doing this way more than what you think. I invite you together back together as a group and as you come together as a group take a moment to be very conscious of your own flow of love and divinity and then look to the side and send it into that person, and it goes in a circle around all of who are here. You can feel what it is as you give and also to receive. You can practice that sense of independence and knowing that you are who you are and you are enough. You are strong and you are independent. However, you become even more so when you share your energy; sharing it with others, receiving it from others with that foundation of the universal light coming into you. There we go I felt the shift. Coming up with in this group is that hologram of the Earth. 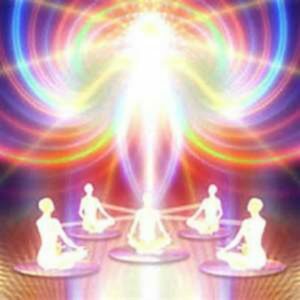 Already the energies are spinning and that Matrix is already infused with all that you have done this evening and that this group as doing right now. As this energy goes in you are infusing the independence, you’re infusing the support of one another, you’re infusing the telepathic vibration which is the next level of consciousness and it all flows down into that hologram which you then release with a piece going out into the Universe. The rest of it going down into the Earth. As this Hologram, as this ball of energy moves down all the way down into the Earth center coming up and out. It clears out within the Earth assisting with the rebalancing. It comes up through the Earth itself. It comes up through each individual. Your own alignment with the Divinity now comes up through that anchored space. You then also take a moment and bring back from the All That Is the remainder of your consciousness so that you know you are connected within your I AM presence and you are balanced with the Earth. It all moves up and down through you the physical, you as your Higher Self and you as the Divine. As you continue to ground these energies throughout the entire world this greater clarity, this independence, this way of sharing and receiving is all clearing out the old energy of the collective consciousness. It moves through the energy of the grass, the water, the trees, it moves through all levels of awareness. Feel what that is for you. So, as we bring this kind of different, wonky, interesting night to a close may I remind you that you are the Human living your life. You are also the reflection of your Divinity. You are love. You are light. You are independence and yet you are a part of the whole. So, remember to first and foremost strengthen yourself with the flow and continuous energy of your divinity. Remember that when you feel compassion and the flow of energy between you and other people to let it be that which is of a balance and if it is not then you disconnect, you disconnect, you disconnect 100 times if you need too and once more open up to the flow and feel the energy and feel the love of your Divinity. Let that be first and foremost everything that happens as you live your life.